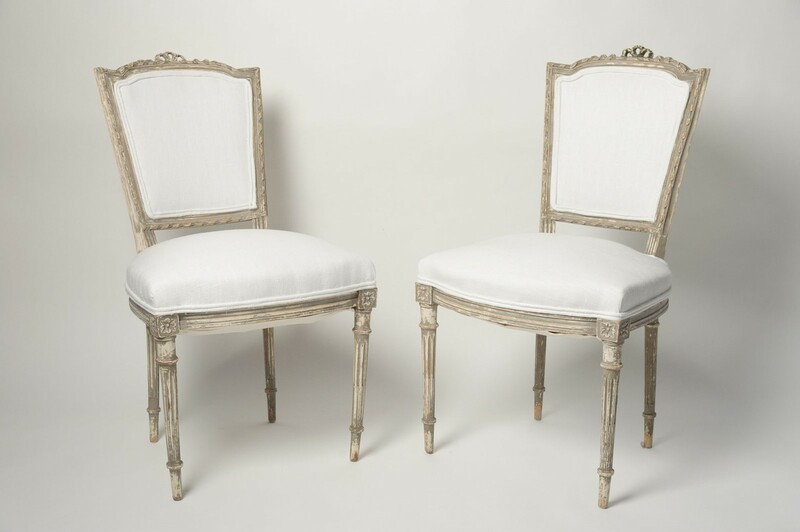 Pretty Pair Antique 19th Century French Louis XVI dining chairs in traces of old soft grey and cream paint with intricate detailing all round. 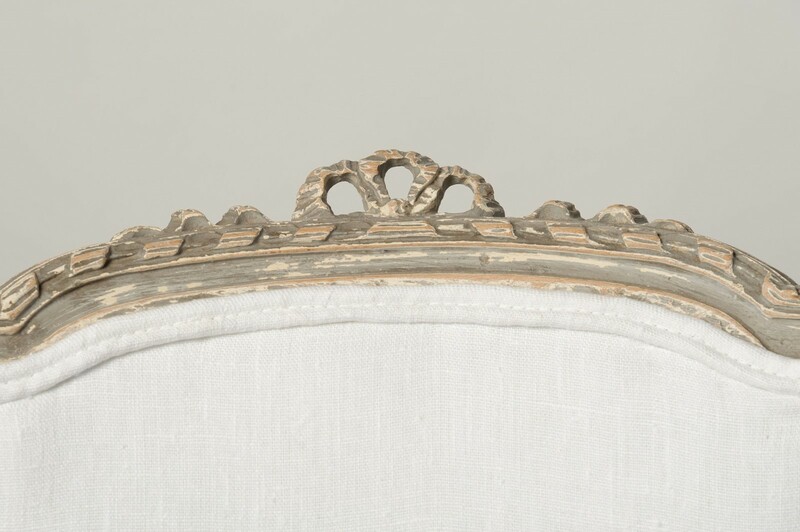 Ribbon crest to tops of these upholstered chairs, which are raised by its tapered fluted legs. 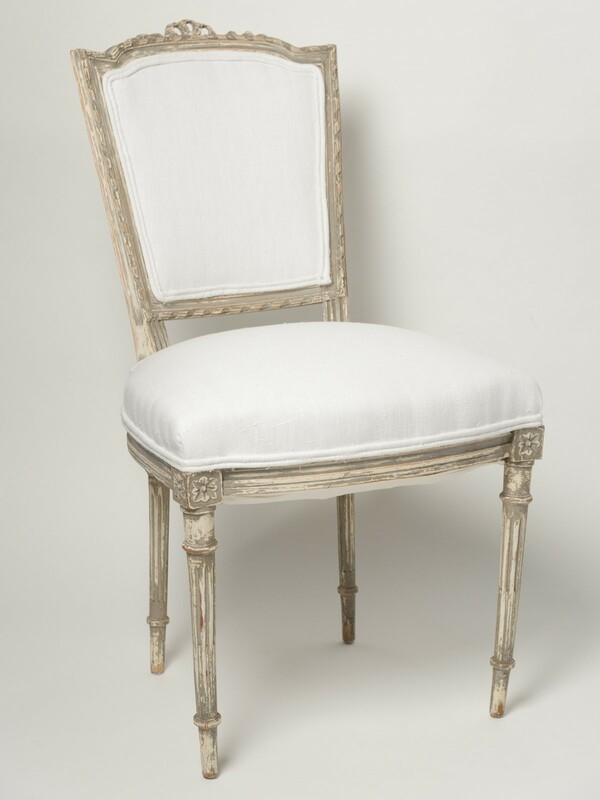 Recently re-upholstered in crisp white linen fabric, these highly decorative and dainty chairs, make great occasional chairs. 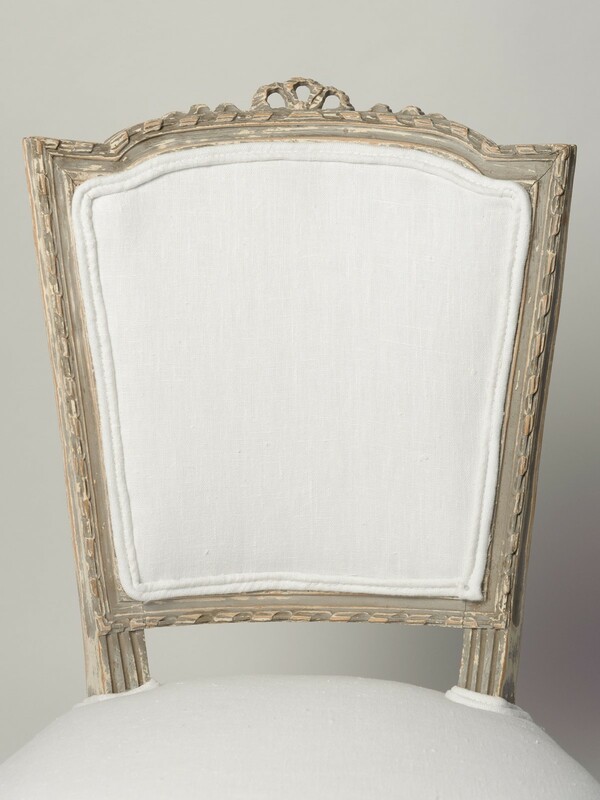 Although sturdy, these chairs are quite delicate so would suit a bedroom or bathroom for occasional use. 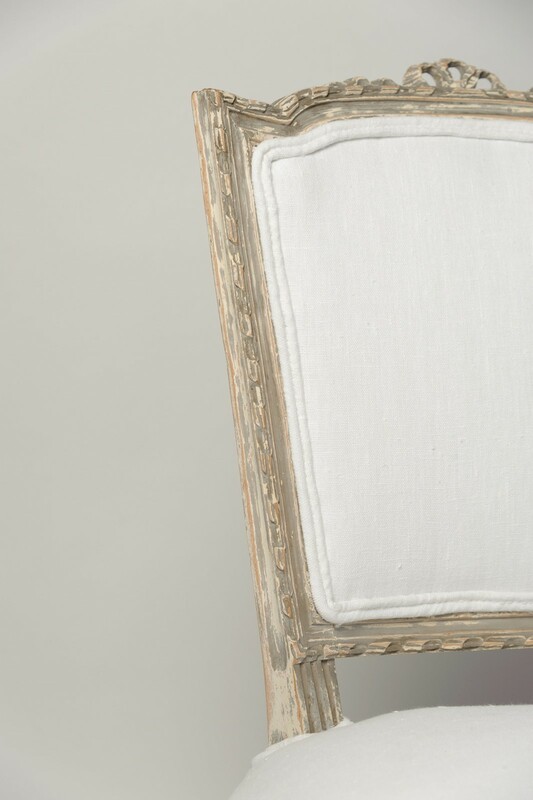 Decorative Antiques UK is a business which has evolved from my passion for seeking beautiful pieces of furniture and Decorative Antiques from all around the world, especially France and Scandinavia. 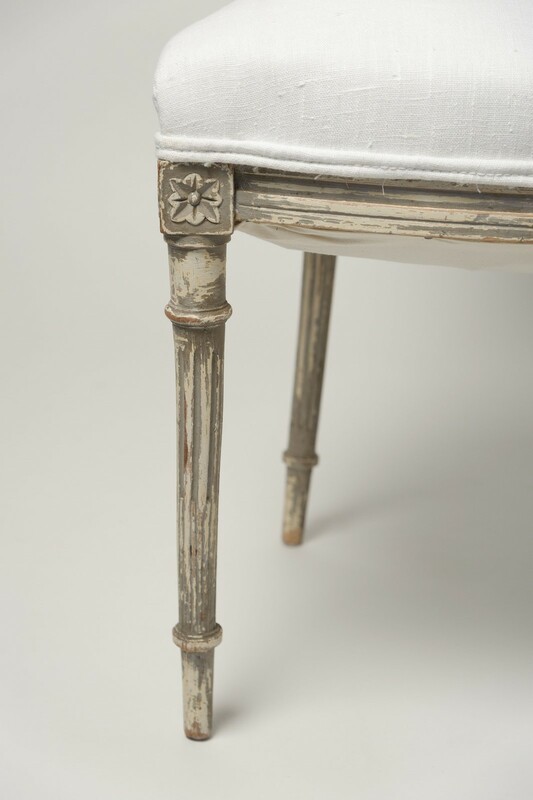 I have a particular love for the faded grandeur style of old French Chateau pieces as well as Swedish Gustavian and am fascinated by the stories behind each of these wonderful Antiques. 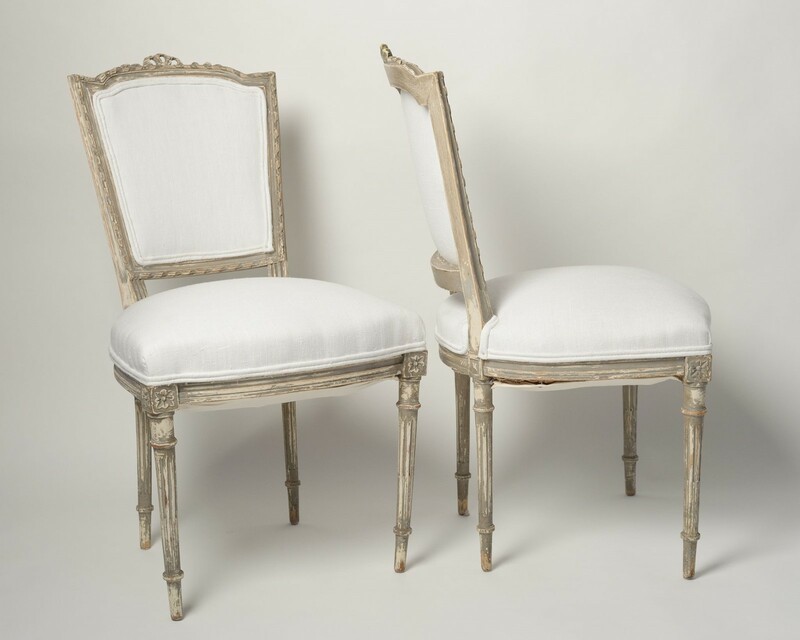 I source antiques from all over Europe and specialise in original painted furniture, period mirrors, Decorative European antiques as well as some Mid Century pieces such as Brass and Glass drinks trolleys and tables. Our Tunbridge Wells home used to act as our showroom, but we have now relocated to a beautiful Georgian shop, set in the village of Hurst Green, Etchingham, East Sussex. Our Victorian townhouse was featured in the October 2013 edition of 25 Beautiful Homes magazine and in Wealden Times magazine February 2014. We exhibit at various events and Fairs throughout the year and all details can be found on our Facebook page under Decorative Antiques UK and our events page on the website. 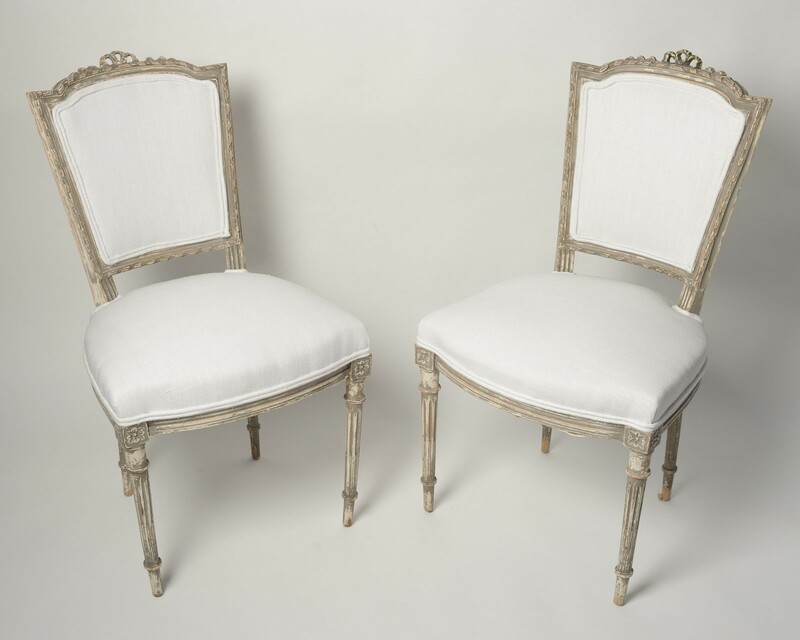 I do hope you enjoy browsing the unique vintage treasures that I have collected for you on the website and please do sign up to my mailing list to keep up to date with the latest information, promotions and latest arrivals.